A spokesman for the Minas Gerais state civil defense agency said Wednesday that the number of confirmed dead from the collapse of a dam in Brazil has risen to 99 from 84. SALEM, Ore. (AP) — Making it easier for Oregonians to get outdoors and finding a way to pay for search and rescue efforts are the focus of two bills introduced early in the Oregon Legislature. PROVO, Utah (AP) — Utah County authorities say a body found in Provo Canyon is believed to that of a missing 36-year-old hiker from Orem. The Sheriff's Office says its search and rescue team with help from a state Department of Public Safety helicopter recovered the body believed to be that of Jake Routt, who was missing since Sept. 16. The Sheriff's Office says the body was recovered near the 9,000-foot (2743-meter) level. The national disaster agency's spokesman, Sutopo Purwo Nugroho, told a news conference that the official search and rescue effort was extended by a day and would end Friday. MEMPHIS, Tenn. (AP) — A search and rescue team from Tennessee has been deployed to Alabama ahead of the expected arrival of Hurricane Michael. The Memphis Fire Department says the Federal Emergency Management Agency has asked Tennessee Task Force Type 3 to report to Maxwell Air Force Base in Montgomery, Alabama. SLATINGTON, Pa. (AP) — Fifty campers on a rafting trip were safely pulled from the rain-swollen Lehigh River in Pennsylvania this week after severe storms spurred heavy currents, officials said. SEATTLE (AP) — The body of a missing fisherman was found by divers inside the sunken vessel, the Kelli J. The Coast Guard said Saturday that the body was found before the vessel was refloated by contractors in Willapay Bay on Friday. The Pacific County Sheriff's Office took the fisherman's body to a local funeral home on Friday night. Hawaii's Department of Land and Natural Resources said about 25 people elected to be airlifted out of a state park on Kauai on Monday. The Department of Transportation continues to work to clear landslides, and crews are working to repair fallen utility poles. PORTLAND, Ore. (AP) — When Nicole Panet-Raymond's family found out she was missing on Mt. Bachelor in Bend, they loaded their car with ski gear, helmet lights and shovels to join the search and rescue effort. Searchers found the 19-year-old's body before her family arrived from Portland. The University of Oregon sophomore from Portland was one of two people who died Friday on Mt. Bachelor after they separately fell into holes at the base of trees. TOOELE, Utah (AP) — Sheriff's deputies say they fear two Utah teenagers who've been missing for two weeks may have been the victims of foul play. The Juab County sheriff's office said in a statement Tuesday deputies are continuing a missing persons' investigation but have suspended a search and rescue effort that began Jan. 2 for 18-year-old Riley Powell and 17-year-old Breezy Otteson of Eureka. BOX ELDER COUNTY — Search and rescue efforts will increase over the weekend in the effort to locate two men and an airplane, officials say. MAR DEL PLATA, Argentina (AP) — Argentina's navy insisted Saturday that a missing submarine had seemed to be in good condition when it set off on a training mission, despite fears it later exploded beneath the sea with 44 crew members aboard. TOKYO (AP) — U.S. and Japanese ships and aircraft were searching in the Philippine Sea on Thursday for three sailors missing since a U.S. Navy aircraft crashed a day earlier. Eight people were rescued about 40 minutes after the crash of the C-2 "Greyhound" transport aircraft Wednesday afternoon, the Navy said. They were taken aboard the USS Ronald Reagan aircraft carrier and were in good condition. A military transport plane from Joint Base Charleston is providing support for the U.S. effort to help find a submarine missing off the coast of Argentina. The aircraft from here is part of a contingent of five C-17 Globemaster III transport planes and three C-5M Super Galaxies delivering U.S. Navy undersea rescue equipment. The last contact with the A.R.A. San Juan, an Argentine navy submarine, was Nov. 15, officials said. ATHENS, Greece (AP) — Hopes were diminishing as darkness fell Friday for six people reported missing in deadly flash floods that struck near Athens, killing 16. The fire department said search and rescue efforts continued to locate the six, all reported missing in the Mandra district on the western outskirts of the Greek capital, which was the area hardest hit. They included two hunters, three motorists and one person who was reported missing from outside a canteen truck stop. LOUISVILLE, Ky. (AP) — Kentucky is sending National Guard soldiers and utility workers to help in areas affected by Hurricane Irma. The Kentucky Air National Guard says it is sending about 25 soldiers to the Caribbean to help with search and rescue efforts in the wake of the Category 5 storm. A statement from the agency says soldiers were deploying Thursday to the U.S. Virgin Islands with two Blackhawk helicopters. High water rescues are dangerous. 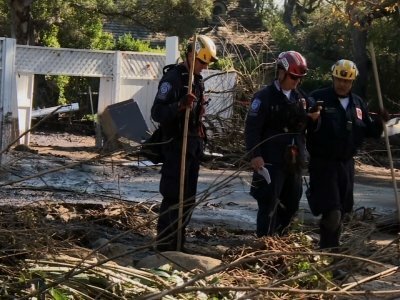 First responders are working around-the-clock to come to the aid of those in distress, offering a chance for residents to evacuate their homes and be relocated to local shelters. "As they are doing rescues, they are bringing evacuees in," said Angela Hollie at The Sanctuary, which briefly operated a shelter opened on Monday, Aug. 28. Calvary Baptist, St. Mary's and Cornerstone also opened shelters in Cleveland. Outside, Tropical Storm Harvey was causing an unprecedented regional weather calamity and prompting a vast search and rescue effort still underway days later. As the 15 residents of La Vita Bella sat in their activity room early Sunday morning — the room where they play games, listen to big-band music and eat popcorn — they joked and laughed, even as flood water quickly rose about their ankles, and then their waists. The U.S. Navy on Thursday released names of one sailor who died and nine others who were missing, including one from Cleveland, Texas, after the USS John McCain collided with an oil tanker near Singapore. Divers recovered the remains of Electronics Technician 3rd Class Kenneth Aaron Smith, 22, who the Navy listed as being from New Jersey. His mother said Smith grew up in Novi, Michigan, and moved to Norfolk, Virginia, as a teenager with his father. SYDNEY (AP) — U.S. military officials called off a search and rescue operation on Sunday for three U.S. Marines who were missing after their Osprey aircraft crashed into the sea off the east coast of Australia while trying to land. ALBUQUERQUE, N.M. (AP) — A body was found in New Mexico not far from where a Colorado pastor parked his vehicle before heading out to search for a supposed hidden cache of gold and jewels that has inspired thousands to hunt in vain across remote corners of the Western U.S., authorities said Monday. LIONS BAY, British Columbia (AP) — Authorities in British Columbia say the bodies of five hikers have been found after they fell more than 1,600 feet (500 meters) to their death in the mountains north of Vancouver. Search manager Martin Colwell says the hikers were crossing an unstable ledge of snow when they fell. Four bodies were found at the bottom of Mount Harvey on Sunday afternoon. A fifth body was discovered hours later. VATICAN CITY (AP) — Pope Francis demanded Sunday that "every possible measure" be taken to protect young refugees, as search and rescue efforts continued off Libya's coast following the latest deadly Mediterranean migrant shipwreck. Italy's coast guard said only four people survived the sinking of a migrant ship carrying around 100 people that went down 30 miles (50 kilometers) off the Libyan coast on Saturday. Only eight bodies have been recovered. GLOUCESTER, Mass. (AP) — Rescue crews are searching for a man apparently swept into the waves while fishing in Massachusetts. Gloucester Interim Police Chief John McCarthy said Tuesday that the unidentified man had been fishing near Rafe's Chasm when he was swept into the water by a large wave at around 3 p.m. He says police were notified of the accident by a 911 call from another man who had been fishing with the victim.